Just Two Bikes (JTB), Inc., a premium quality recumbent cycle manufacturer headquartered in Hugo (a Twin Cities suburb), announced today that the company has been purchased by Jim Dugelman, Sales and Marketing Manager of JTB and Dale Hedstrand, President of Focal Point Financial Services, located in White Bear Lake, MN. They have acquired the firm for an undisclosed sum from Jim Muellner, who founded JTB in 1993 and has been its research and design engineer. Under the new ownership, Jim Muellner will continue to serve in that capacity and as a business consultant. Jim Muellner's previous business ventures included Smarte Carte, Inc. as well as many others. With the sale, Dugelman (who has over 15 years of cycling industry experience) assumes the role of General Manager & Chief Operating Officer and Hedstrand is Board Chairman & Chief Executive Officer. "I'm pleased to work with the new owners," Muellner noted, "it will give me the opportunity to continue to express my passion for quality engineering and specialized design applications for recumbent cycling products that has represented an important part of my life for more than a decade." 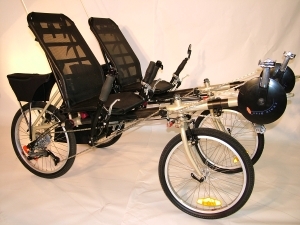 JTB manufactures and markets a dual recumbent (side-by-side tandem) called the "Sociable". Muellner loves to ride -- commuting to work, riding in long-distance tours and participating in major event rides. "On one of my first organized rides, I discovered that many people who wanted to ride together had different skill levels and it was a challenge for them to communicate with one another." That realization led to the design of the Sociable, which allows two people of dissimilar skills to ride easily, safely and enjoyably side by side, each one contributing what they're capable of, while they have a conversation. Dugelman and Hedstrand plan to keep the company's operations in the St. Paul, MN suburb of Hugo and increasing revenues by recruiting more dealers and representatives as well as additional marketing efforts to the special needs, rental and retirement community markets.